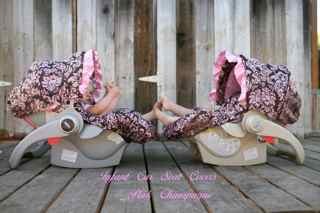 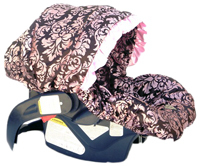 Baby Bella Maya infant car seat covers offer parents a safety benefit not available on other car seat covers: snaps. 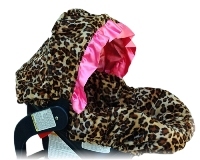 The covers adds style to infant carriers, but in the safest possible way. 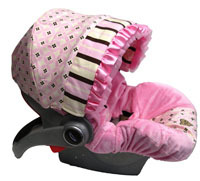 No need to remove the straps repeatedly in order to keep car seat covers clean. 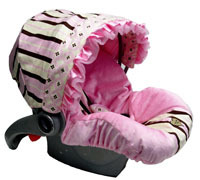 The snaps allow for easy access that does not require removing the car seat's straps. 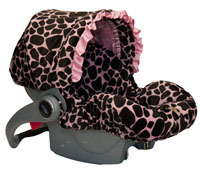 Simply slide straps through the inserts, snap it up and you are ready to go. 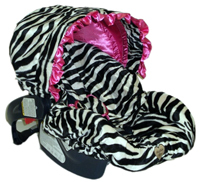 Canopies available with trim and ruffle, matching seatbelt pads included. 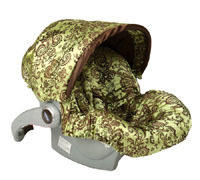 Covers are made of woven polyester blends. 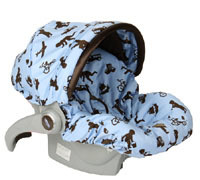 We recommend hand washing in cool water, lay flat to dry.